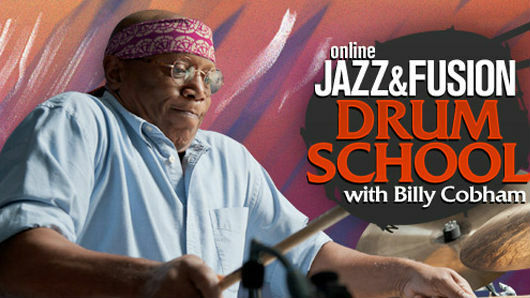 Now you can build your chops online directly with drumming legend Billy Cobham. No one has the groove, the feel, the absolute "musicality" that Billy Cobham brings to the drums. And with the Jazz & Fusion Drum School with Billy Cobham, not only do you get unlimited access to Billy's entire library of video lessons, but whenever you have a question, you can submit a video to Billy. Then Billy responds with his own video giving you the kind of guidance that will help you get better FAST! Hit him up as much as you need. It's called Video Exchange™ Accelerated Learning and it puts you in direct connection with Billy Cobham and a whole community of drummers dedicated to expanding their abilities. Think of it this way: Both you and Billy can work together at your own convenience. That's the same Billy Cobham behind the ground breaking Spectrum album, and who has played with everyone from Miles Davis to the Mahavishnu Orchestra. That's hundreds of online video lessons, unlimited video exchanges and a whole community of like-minded drummers. The crazy part is that it only costs $30 per month or less, depending on the length of your subscription. Check out these free sample lessons and join today. Your satisfaction is guaranteed.